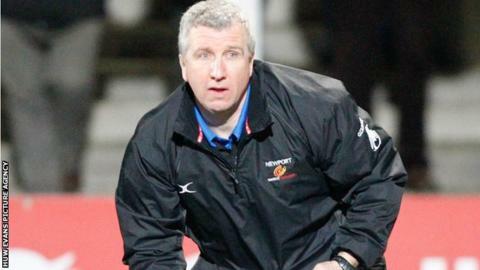 Lyn Jones was appointed director of rugby at Newport Gwent Dragons in 2013. Newport Gwent Dragons coach Lyn Jones says his side must beat Bucharest Wolves again on Friday if they want to win their Challenge Cup pool. Dragons scored five tries to beat the Romanian team on Saturday and are second in pool three behind Newcastle. Jones says another bonus-point victory will set Dragons up for their match against the Falcons in January. "It's critical because we're playing towards rounds five and six," he said, adding: "We want to win our group." The 50-year-old said: "We want to go up to Newcastle and beat them. We played very, very well against them a month ago, stuffed them in fact, but we didn't win the game on the scoreboard. "We need to go up there and do a job on them, so we need to build ourselves into the best position possible to achieve that. "And then build towards a winner-takes-all against Stade Francais at Rodney Parade. "We're very confident we can build on this and beat Newcastle and Stade Francais." "10 out of 10 for our players, a job well done." The Welsh region are three points behind Newcastle, after they beat Stade Francais 30-23 on Friday night. Dragons travel to Newcastle for their penultimate pool game on Saturday, 17 January, before hosting French side Stade Francais a week later. A brace from Andrew Coombs, as well as tries from Ashley Smith, T Rhys Thomas and James Thomas, secured Dragons' bonus point on Saturday. "We're very, very pleased with the performance and the result," said Jones. "These games can be as hard or as simple as you want to make them, and we came here with a very respectful attitude to the opposition. Dragons are 11th in the Pro12 table after just one league win this season, but Jones says their form in Europe bodes well for the future. "As far as our development as a team and a squad is concerned, it needs to be reinforced from time to time with victories," added Jones. "It has to be a little bit more than just playing well, it has to be winning games as well."